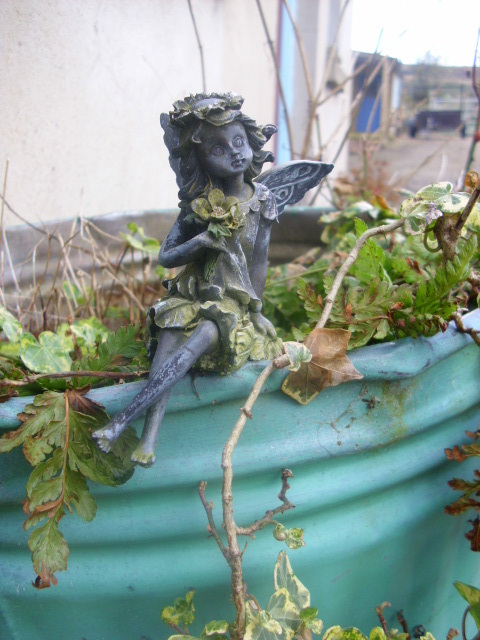 The Eve of Bealtaine, the beginning of the celebration of the first day of Summer according to the old Celtic calendar. The good weather this year make the vibrancy and energy of the season more tangible than usual. There is an old saying to predict the weather ” Ash before Oak, you’re in for a soak. 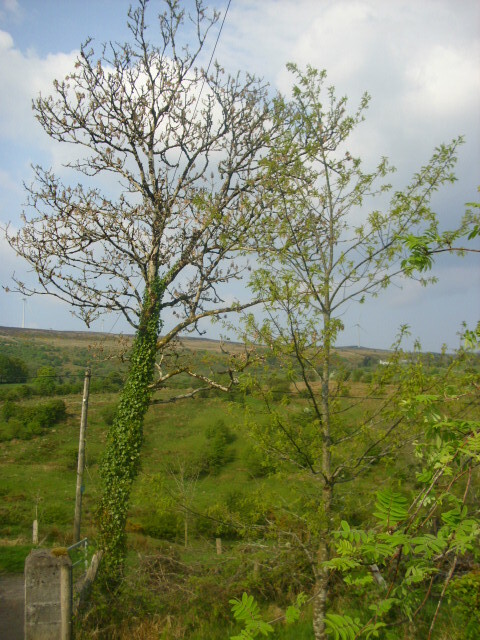 Oak before Ash, you’re in for a splash.” As you can see from the pic above the Oak is in leaf first, in Arigna anyway! 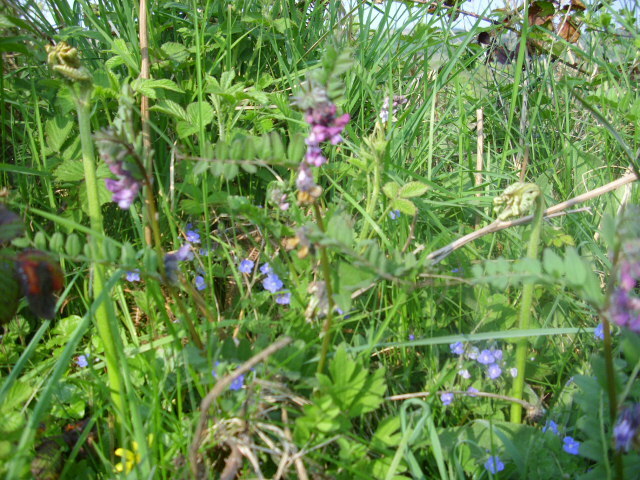 The hedgerows are full of wildflowers right now. 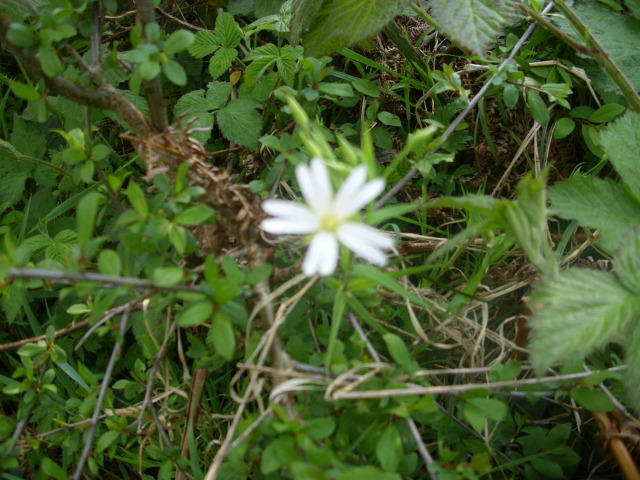 The name Bealtaine comes from the Celtic god, Bel, meaning bright one, and the Gaelic word, teine, meaning fire. Midnight tonight is the traditional time for fires to be lit. The lighting of fires was seen as a symbol of purification for man and beast. The Celts used to build 2 fires and drive the livestock between them, this ensured fertility and a good milk yield. 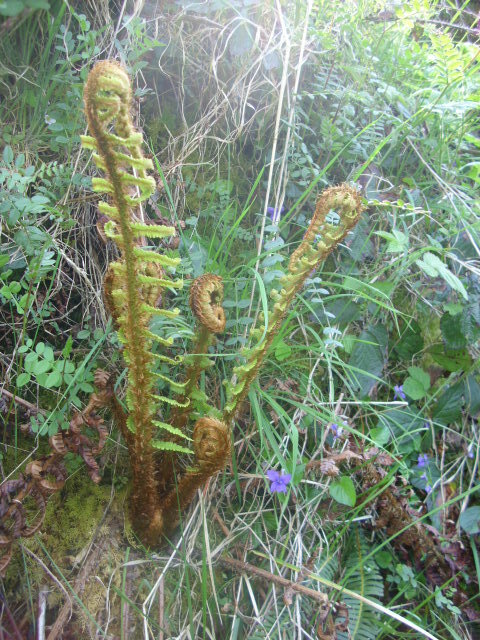 Ferns are almost fully unfurled now. The Earth’s energies are at their most active now, everything is a fresh new green. The Hawthorn or Maybush is just coming into flower. It was an important plant at Bealtaine, bunches were collected early on a May morning and placed above the doors and windows as a protection. They were also placed on doors of the animal houses. Anyone know what this tiny flower is? The hedgerows are full of it. The dew collected on a May morning was believed to have magical properties. If used to wash your face it was said you would’nt be burnt by the sun or get wrinkles. Strimming & Mulching @ Prospect Cottage. We awoke to another beautiful sunny morning here in Arigna. The heat is really building in the polytunnels and everything in there has really taken off. Lots of pricking out and potting on to do. 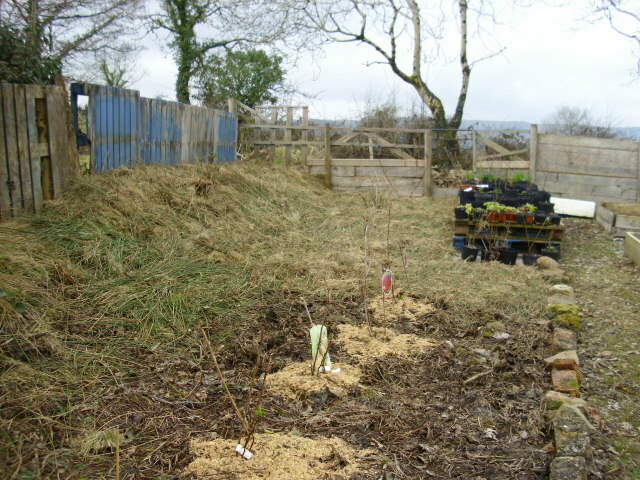 All the outdoor fruit bushes have leafed up and fruit buds will be following soon. We will have to be vigilant for frosts, even a sheet of newspaper held on with clothes pegs is enough to keep off the frost at this time of year. Strimming the rushes is another annual job to be done here. 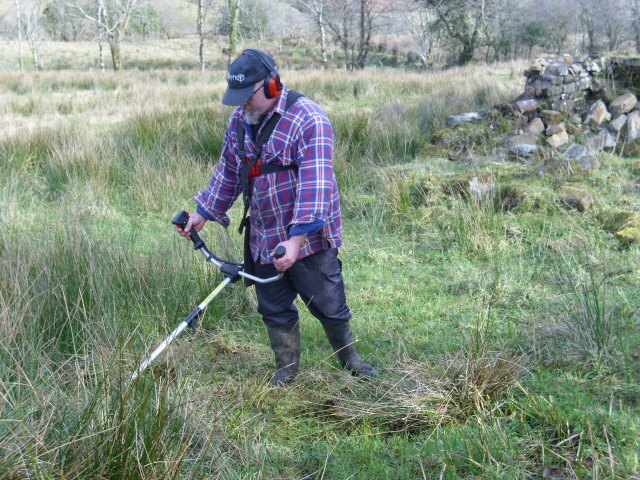 When we bought this place the rushes had’nt been cut for years and were about five feet tall. That first year our neighbour cut them with a tractor and mower, Andy now strims them once or twice a year and the difference is amazing. The rushes are’nt as strong growing and the cutting has given the grass a chance to come on. Three fields that were just full of rushes have now become fairly decent pasture. So, what to do with all those rushes? They can be left in situ where they will rot down fairly quickly and provide some fertility. We collect them to use for mulch, particularly around the fruit trees and bushes. As you can see from the above pic above we have already started this years mulching. Now is a good time to mulch as the soil has warmed up and is still damp. Mulching conserves moisture, keeps down weeds and ultimately rots down thus improving soil structure and fertility. It also protects plants during the Winter reducing the effects of frost. Autumn time, abundance, independence and saving seeds. What is it about water? Out and about in Arigna. part 2. Out and about in Arigna.